Wikipedia tells me there are a number of ways to take the caffeine out of coffee, the most common being washing the beans with acid a number of times. I’m really sensitive to chemicals in food. 3pm I drank a decaf. 1.30-3am I couldn’t sleep. Not the first time this has happened, no siree. Good morning folks. 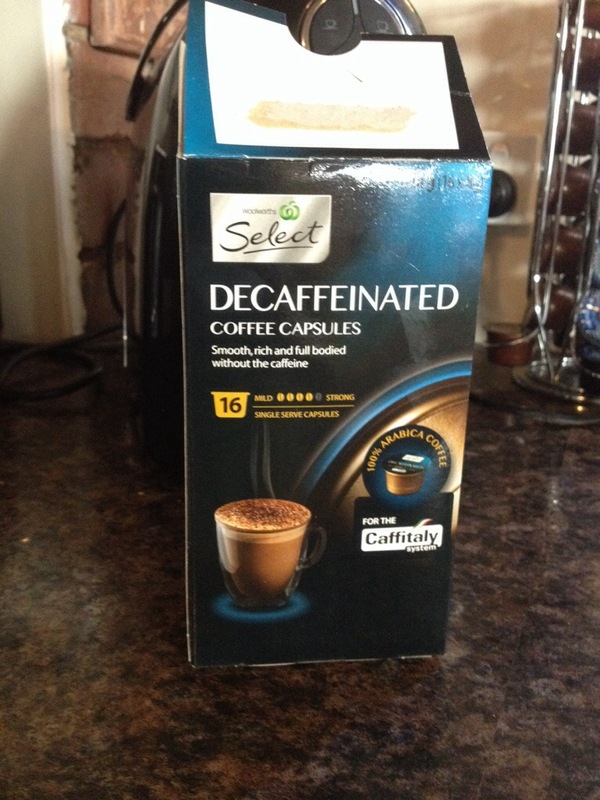 I’m going to make myself a real, caffeinated, acid-free coffee, and attempt to wake up. Have a great day! Let me preface by saying this: I am not a gardener, not the way some people are gardeners. I envy those people, truly I do, and I admire their skill and unbelievable knowledge, and I love that they can look at a plant, look at soil, look at a garden, and know exactly what it is that needs to be done to love that soil/plant/garden. I used to love hearing Peter Cundall on ABC radio on Saturday mornings on the gardening show, but I think what I loved most was the soothing tones of his accent and the fact that he was still on the radio just as he’d been on the radio when I was a little kid and my dad used to do the gardening. And it soothes me that there are people in the world who know about gardening, and about how to love the soil/plants/gardens with problems, and that no problem is too big, not when you know how to deal with it. We live in a quaint little house with a sweet little cottage-style garden out the front with a brick-paved path and a picket fence. It has roses, and occasionally I do something, like prune them. When we moved in much of the rest of the garden was overgrown and woody with big daisy bushes that I didn’t know how to deal with. In my non-gardening ignorance I ripped them out and planted in that fine grey soil some plants I liked. They died. It took me a few weeks to notice that that fine grey soil didn’t absorb the water like it was meant to, didn’t soak in to the root system and nourish my plants; it was basically sand. I am not a gardener, but I do know (maybe I absorbed something from years of background Peter Cundall) that only the hardiest of plants can grow in sand, and that plants need good soil, with nutrients. Now we were poor at this stage, both in time and in money, and our little cottage garden was neatly divided by the brick-paved path into the front half (next to the fence, where the rubbish plants were that I’d pulled out) and the back part, where the enormous roses grew, the soil was worst but there was enough established stuff there for it to look half-way decent and not full of weeds. I only had enough spare money on any given pay period to buy a small amount of gardening things (especially as I am not a gardener), so I focused on the front part. I bought compost, horse poo, pine bark, native plants, nice little trowels so my pre-schooler could help while my toddler napped. I had another baby. The brick-paved path became so overgrown with weeds that my husband mowed it one Sunday afternoon, and I got to him just in time before he mowed the one plant that had actually taken root and was growing in my slowly-ripening soil. I dreamed that one day the front part would be blossoming and lovely, with foliage and flowers and colour and life. I dreamed that one day the front part would be so well established that I could take all the lessons I learned and apply them to the back part, behind the path. It was a lofty dream: I am no gardener. Something happened once in those years, some small thing that wasn’t significant at the time, and only became so much, much later. I ate a nectarine in the car and, when I finished, I threw the pip into the garden, in the no-man’s-land over behind the rose bushes at the back. You’ve guessed what happened already, haven’t you? I didn’t. I’m not a gardener. We parked our car there, on the concrete on the other side of the fence next to the roses. I noticed it vaguely while wrangling kids in and out of the car, dealing with seat belts and straps. Oh look, I’d think. A different sort of weed. Life got busy. Three kids. School. A job, suddenly. The following summer that little weed was getting so large that it was brushing on the car when I parked it, and getting annoying. One of my neighbours, my wonderful friend Christie, IS a gardener, and one day in the early spring of 2012 she offered to come down and help me whip that front lawn into shape. I told her about my soil, about the things that had died, and she said not to worry, she had plants and cuttings and home-grown things galore to spare, and if these ones died we could plant new ones. For free. We made a date, and together we weeded and dug and wrangled and turned and sifted and pruned and planted, until my jungle resembled a garden again, and my heart was filled to bursting. Christie said to me “You’ve got a nectarine tree growing behind your roses, what do you want to do with that?” I looked. She was right. My “weed” had become a tree. It had never fruited, never blossomed even. It was in the way of the car, and looked a bit silly growing through a fence behind a rose bush. I told her to chop it down. She did. My garden had never looked more beautiful. I went away for two weeks that spring, on a magical adventure that changed my life. And then, within three weeks of me getting back, my dad died. I barely noticed my garden for months. After a few months of rain and sun and grief and summer it had, unfortunately, sprouted abundant weedage again. I resigned myself to starting again. Later. When things calmed down. Things didn’t calm down. 2013 jumped from crazy to crazy in a whirlwind of wonderful and new and, well…crazy. We went away, again. My sister-in-law came down to house-sit, and, wonderful wonderful avid gardener that she is, she tamed the beast again and killed the weeds and nurtured the things Christie had planted, and planted more, more, more, until our garden lived and teemed and thrived like I always dreamed it could. It was beautiful. Look at that nectarine tree! 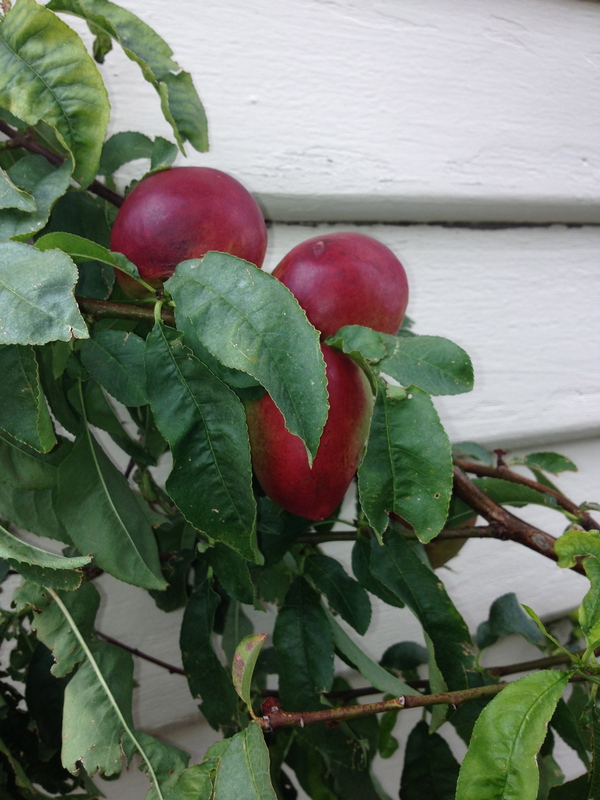 And then…look at those nectarines! We picked them the other day. Thanks to Christie’s radical kill-the-thing pruning, and the fancy-pants tap timer that my sister-in-law put in, this tree that sprung from neglect in a forgotten corner of a non-gardener’s garden (still stuck back there behind the rose bush) produced some of the sweetest, juiciest most tender nectarines I’ve ever eaten. I can’t take any credit…all I ever did was neglect it and then order its demise. I’m no gardener, not at all. 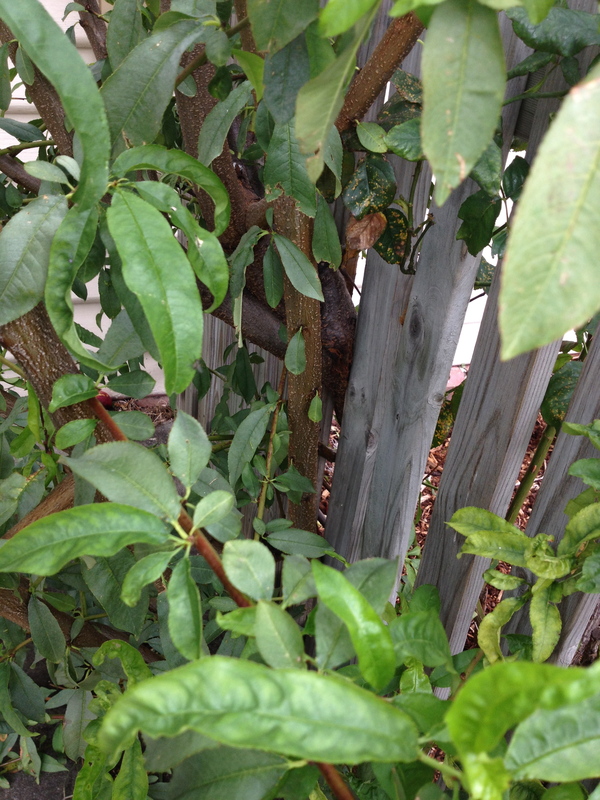 All I can say to my nectarine tree is “I’m sorry”, and “thank you”. My nectarine tree story has more real-life applications than I can even begin to touch on, but I think the biggest takeaway for me is this (okay, apart from the nectarines). Just because I’ve felt neglected at times, or severely pruned at times, doesn’t mean life is ending. Harsh treatment and/or neglect can be the very thing that makes ME grow and be fruitful. In all honesty, if I’d set out to plant a fruit tree in my own steam I probably would have killed it. Don’t resent the tough-love seasons: they can be the very things that make you grow. I’ve noticed a theme in my novels. It sneaks past me in the first draft and lurks, just out of view, as I pick through with my editing pen. This theme just doesn’t want to be weeded out. Worry. To the point of anxiety. Writers inject so much of themselves in what they create. Yes, I just so happen to struggle with worry. I worry about forgetting important things, upsetting others, hurting a friend’s feelings. I worry about feeding my kids enough veggies and the right kind of protein. I worry that my kids will grow up in a crazy world and that they’ll never realize how much I love them. Most of all, I worry that something will happen to one of them. Or my husband. When my husband and I first got married, we adopted a dog named Sanders. That dog loved to bark. He’d yap at the mailman. The squirrels. A particle of dust whizzing through the air. All the time, that dog would go on barking. We’d get after him. “Sanders! STOP barking!” He’d look right at us and keep on going. I can read the words of Scripture all day long. The ones that say “Don’t worry”. But, some days, it’s like I’m looking at Jesus and just worrying anyway. 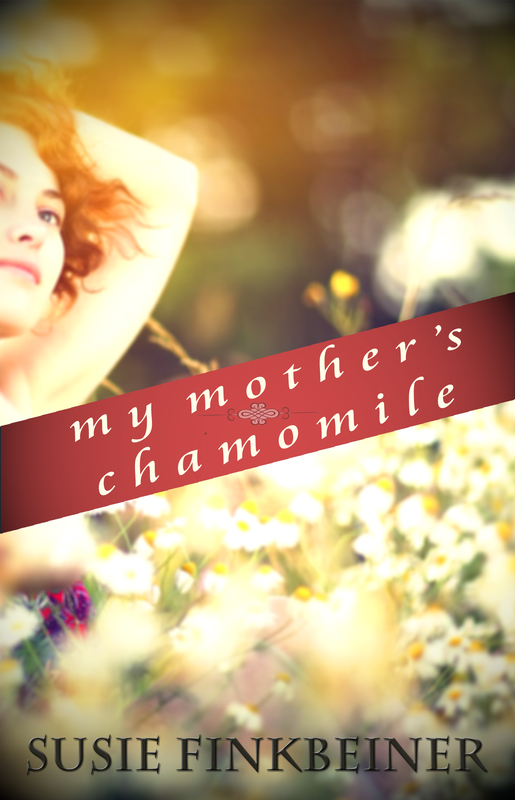 In my newest novel, My Mother’s Chamomile, my character Olga struggles with worry, too. Most of her anxiety revolves around her daughter. The issue, her issue, is that she doesn’t find God trustworthy with what He’d given her. And when I worry, that’s exactly what I’m saying, too. I’m looking God square in the face and practically barking, “I don’t trust You”. And going around yapping my fool head off when what I really need to do is hush up. Calm down. Let go of the controls that I think are steering my life, but that are just making me go round in circles. Turning off the barking worry isn’t easy. In fact, some days it seems darn near impossible. Good thing I’m not left to do it alone. Susie Finkbeiner is a wife and mother living in the beauty of West Michigan. When she’s not busy writing, she enjoys playing Scrabble with her husband, zoo trips with her kids, coffee dates with good friends, and quiet moments to read. 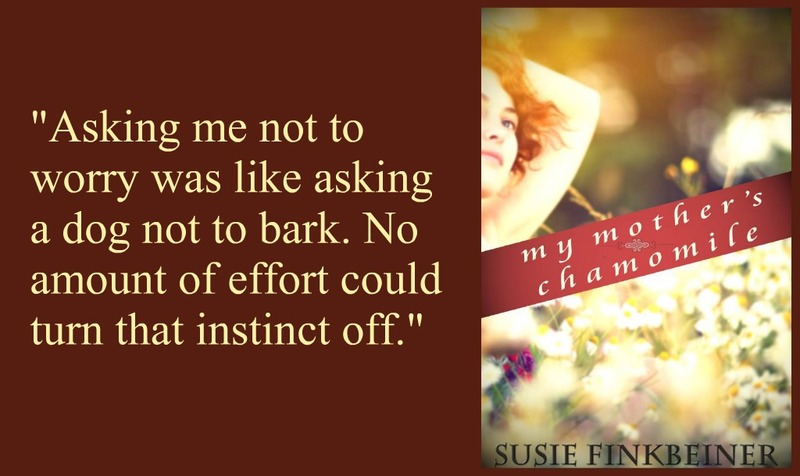 Susie is the author ofPaint Chips and My Mother’s Chamomile, both published by WhiteFire Publishing. Susie is represented by Ann Byle at Credo Communications. I jammed my fingers in a cafe door in town the other day. Not in the way that you close the door on them and you say “ouch” and give them a bit of a shake until the blood flows back into them, I mean I grabbed hold of a door jamb for support for ten seconds, just as the big glass monstrosity of a door swung shut again. I’d grabbed the hinge side. The door wanted to be where my fingers were, and my fingers weren’t much of a match for stopping them. The point is, it hurt. A lot. I managed to put down the thing coffee I was holding and reach across myself to push the door open again enough to extricate my fingers. I said “ouch”, or some variation thereof. Here’s the other point: nobody, not one person in that coffee shop, nor anyone walking outside, noticed. This is understandable; my body was shielding the view from the people behind me, the person for whom the door had opened had already walked away, I was on my own, waiting for someone. People in coffee shops make remarks like “ouch” all the time, if they spill a dash of coffee on themselves, if they bang their toe, if they bite an ulcer on the side of their mouths. In hindsight I wouldn’t expect anybody to jump up and demand to know whether I was okay. I moved back to my chair, careful not to grab the door jamb this time, and sat down. I didn’t take a photo, although I probably should have, because there were craters in three of my fingers a full half-centimetre deep, and although the skin hadn’t been broken it had been pushed down to the level of the bone. I held them up to the level of my face, partly to see them, half-wanting to catch the eye of someone, to debrief, to say “look at my fingers!” but nobody looked. I wanted to say “OUCH” again, loudly, but it was after the fact, and it wasn’t like there was anybody there who cared enough for me to say it to. I sat in my seat and watched the people and held my poor fingers against my hot coffee to soothe them, and waited. By the time my friend came I had tears streaming down my face. I held up my hand and said, probably sounding as pathetic as I looked, “I jammed my fingers!” She was, of course, brilliant. She was sympathetic in the way that I needed, she got me some ice and some tissues to wipe my face, and she sat with me and asked “what happened? !” It helped. Simply by her presence and her willingness to listen she helped enormously. I hadn’t realised how much tension I’d been holding in my body since the incident until I felt it dissipate. The fact that someone acknowledged my experience helped me to move on. (My fingers are fine, by the way. They are a little sore if I touch the place where they were jammed, but otherwise no injury at all. I’m very glad it wasn’t a child or an elderly person that it happened to though). My fingers aren’t that much of a big deal, but it made me think a lot about the difference it made for me to be heard. It made me think about the stories of older people who lived through trauma (especially the sexual abuse stories) as young people, and told no-one, or who weren’t believed. It made me think of returned soldiers, especially those struggling to find their place in life again, and the stories they can’t talk about and how it affects them. It made me think about the times in my own life when I’ve shared a story, or not been able to share a story, or a thought, or a feeling, or a niggling doubt. We were made to listen, and to be listened to. This is the basis of friendship, of community, of family, I think. We were made to speak, and designed to be heard. Who are you listening to today? What is it that you need to tell? This was written by a guy called John, who is one of the best poets I’ve discovered writing today. He writes poems over at his blog just about every day (and, if you’re so inclined, you would do well to hop over and read them). He wrote this yesterday, and it made me gasp and sigh with truth. I look forward to that picnic. Actually, let me backtrack a minute. First of all let me say a huge THANK YOU to all the dear, dear friends who called/emailed/texted/messaged me the other day after Thursday’s post. Your love and support was overwhelming, and touched me deeply. Love you all. And I am okay. Really. Some days you go through stuff. And sometimes, if you’re lucky, instead of just taking you out, those days end up teaching you something about yourself. And that’s what happened. Sometimes stuff happens, stuff that looks bad, feels bad, smells bad (oh no, I know the worst joke about that) actually isn’t bad, but is working in our best interest. What he’s saying is that sometimes God does things (or allows things to happen) that look bad, but are actually used for our good. And you know what? He’s right. So I’m sitting in church listening to this, and I figure that it’s probably okay now for me to take my metaphorical hands from my metaphorical ears and to think about whatever is going on in my brain, namely the stuff I posted about on Thursday. Could this problem be God’s way of helping me? You know what? This is the reason I sat up and started really listening. I’d thought about this just a few days before. 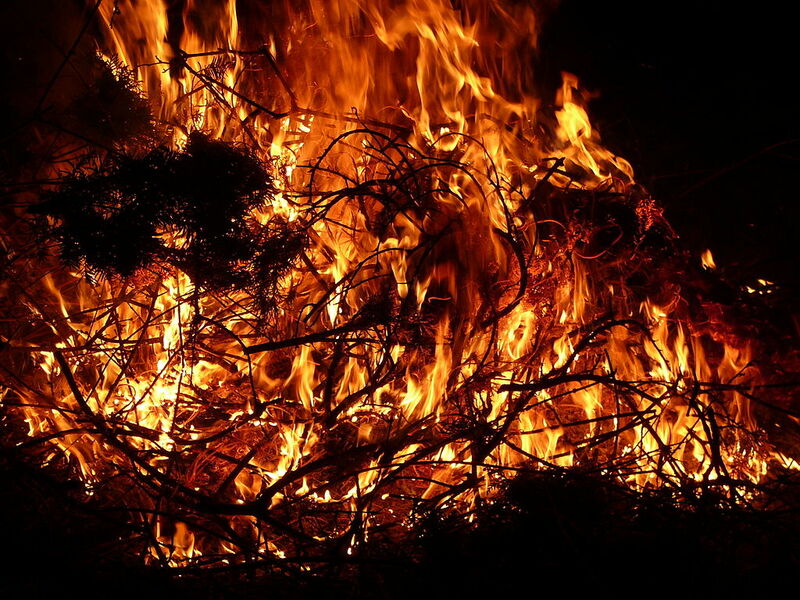 I’d been so depressed that I’d thrown myself into my work, not the new project that I thought I’d be working on, but pulled out an old one that I’d loved and been proud of, but one where the problems in pushing it through to completion were so overwhelming and seemingly impassable that I’d given up on it. I felt like I was lashing out in anger by opening up that old can o’ worms again, but yesterday in church I wasn’t so sure. That anger and frustration were the things that were fuelling me into actions I hadn’t thought about taking, and maybe instead of being sidelined I was actually walking backwards to get a good run up and vault over that insurmountable wall. I didn’t realise it, but I’d got too comfortable. As for the original problem I posted about last week, I’m okay. I’m a big girl, I know how to roll with life’s punches and to pick myself up again. That’ll be okay, I know it. Life goes on. And if a week of tears and anguish has been the catalyst to hurl me back into the race and set my face to the challenge again, then, yes, I guess I can say it’s been worth it. 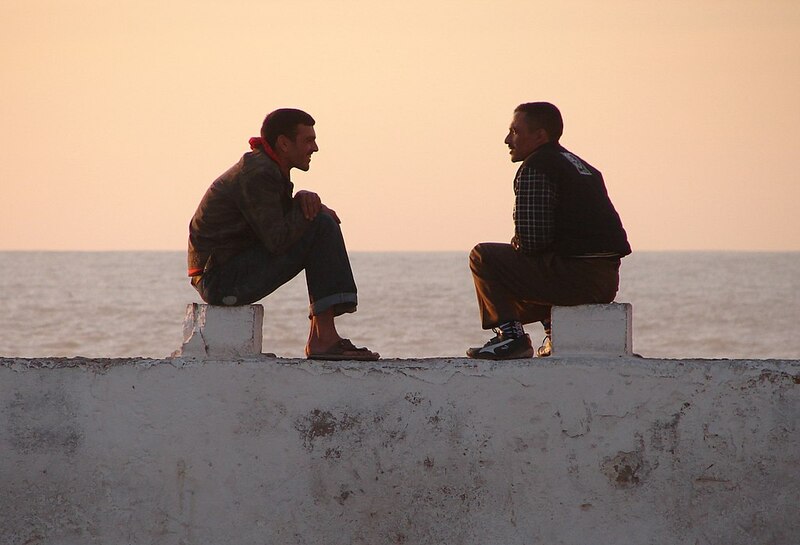 On Friendship, Heartbreak, and Being Worth It. I’ve had a hard time recently (yes, I’m being very honest here, be nice to me, okay?). Something came up, an issue, a problem, with someone I loved dearly, and trusted. A close friend. It may have been a small thing, but it hurt me unimaginably, left me with those deep feelings of wanting to lash out, wanting to hurt back. Spite. I’m not a spiteful person; I’m not a vindictive person at all, and the fact that I was feeling such feelings scared me. It felt like I was in grade four again, this stupid attitude of “he sat next to her and not me”, or “she promised me that I could come to her sleepover, and then she invited somebody else instead!” Dumb stuff. Kid stuff. I’m a mature adult, and I earned that maturity through a lot of dumb mistakes I’ll not make again. In other words, I Know Better. I do! I know that love is a choice not a feeling. I know that life goes in seasons. I know that hearts mend, that people grow and change, that sometimes stuff is hard. This knowledge hasn’t stopped me wanting to lash out though, to take my hurt to Facebook and wail about it. I haven’t. And I WON’T. The problem is mine, not my friend’s, and doing anything like that would only make it worse (okay, MUCH worse), and I’d regret it. And I know I won’t always feel this way. Heck, by the time I post this I may not even feel this way any more. I talked to people, in person. I chose trusted friends, people who weren’t connected to my friend or the situation; people I knew who loved me and who could listen to me without judging and without condemning me or telling me I sound like a ten year old. People who could just listen. It helped. A lot. …and then when I did allow myself to get close to people and I got hurt, there were others there, a whole network of people who could offer me a hand, an ear, some grace, while I got myself up again. I still love my estranged(ish) friend dearly. Hello, estranged(ish) friend, wherever you are. And, no matter the stupid feelings I’ve been going through of late, that once-upon-a-time long-ago decision to love people, to allow myself to get close to people again, was worth it. It’s still worth it. Even if it means, for a little while, disconnecting myself some from places I’d see them and giving myself a serious kick up the backside from time to time. So long as I take care of myself, so long as I don’t do anything stupid that I’m going to regret, then allowing myself to get close, allowing my heart to be vulnerable enough to get a little broken, it’s still worth it. Remind me of that tomorrow, when I go through this same stinking emotional roller coaster again, okay?